This well-known biennial root-plant is not mentioned in the Bible; according to De Candolle, it was not cultivated before the sixth or fourth century B.C., although Wönig claims to recognize it in an Egyptian picture from the Beni Hassan (XII. dynasty). 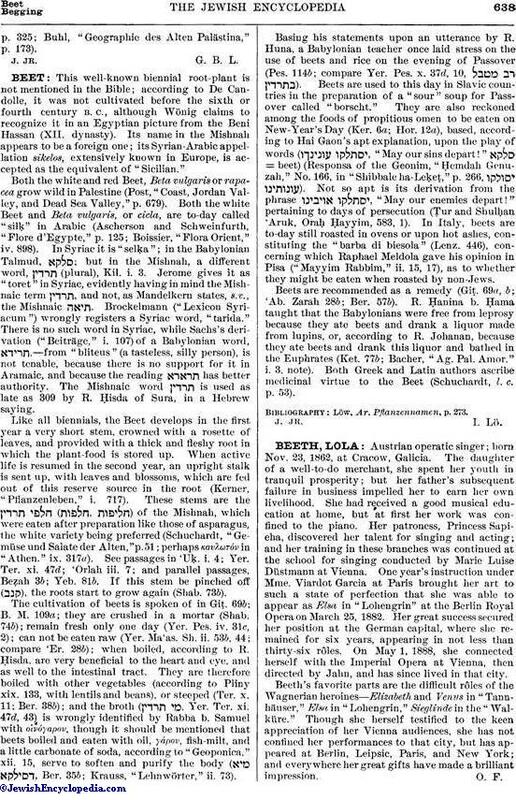 Its name in the Mishnah appears to be a foreign one; its Syrian-Arabic appellation sikelos, extensively known in Europe, is accepted as the equivalent of "Sicilian." Both the white and red Beet, Beta vulgaris or rapacea grow wild in Palestine (Post, "Coast, Jordan Valley, and Dead Sea Valley," p. 679). Both the white Beet and Beta vulgaris, or cicla, are to-day called "silḳ" in Arabic (Ascherson and Schweinfurth, "Flore d'Egypte," p. 125; Boissier, "Flora Orient," iv. 898). In Syriac it is "selḳa"; in the Babylonian Talmud, ; but in the Mishnah, a different word, (plural), Kil. i. 3. Jerome gives it as "toret" in Syriac, evidently having in mind the Mishnaic term , and not, as Mandelkern states, s.v., the Mishnaic . Brockelmann ("Lexicon Syriacum") wrongly registers a Syriac word, "tarida." There is no such word in Syriac, while Sachs's derivation ("Beiträge," i. 107) of a Babylonian word, ,—from "bliteus" (a tasteless, silly person), is not tenable, because there is no support for it in Aramaic, and because the reading has better authority. The Mishnaic word is used as late as 309 by R. Ḥisda of Sura, in a Hebrew saying. Like all biennials, the Beet develops in the first year a very short stem, crowned with a rosette of leaves, and provided with a thick and fleshy root in which the plant-food is stored up. When active life is resumed in the second year, an upright stalk is sent up, with leaves and blossoms, which are fed out of this reserve source in the root (Kerner, "Pflanzenleben," i. 717). These stems are the of the Mishnah, which were eaten after preparation like those of asparagus, the white variety being preferred (Schuchardt, "Gemüse und Salate der Alten," p.51; perhaps καυλωτόν in "Athen." ix. 317a). See passages in 'Uḳ. i. 4; Yer. Ter. xi. 47d; 'Orlah iii. 7; and parallel passages, Beẓah 3b; Yeb. 81b. If this stem be pinched off ( ), the roots start to grow again (Shab. 73b). The cultivation of beets is spoken of in Giṭ. 69b; B. M. 109a; they are crushed in a mortar (Shab. 74b); remain fresh only one day (Yer. Pes. iv. 31c, 2); can not be eaten raw (Yer. Ma'as. Sh. ii. 53b, 44; compare 'Er. 28b); when boiled, according to R. Ḥisda, are very beneficial to the heart and eye, and as well to the intestinal tract. They are therefore boiled with other vegetables (according to Pliny xix. 133, with lentils and beans), or steeped (Ter. x. 11; Ber. 38b); and the broth ( , Yer. Ter. xi. 47d, 43) is wrongly identified by Rabba b. Samuel with οἰνόγαρον, though it should be mentioned that beets boiled and eaten with oil, γάρον, fish-milt, and a little carbonate of soda, according to "Geoponica," xii. 15, serve to soften and purify the body ( , Ber. 35b; Krauss, "Lehnwörter," ii. 73). Basing his statements upon an utterance by R. Huna, a Babylonian teacher once laid stress on the use of beets and rice on the evening of Passover (Pes. 114b; compare Yer. Pes. x. 37d, 10, ). Beets are used to this day in Slavic countries in the preparation of a "sour" soup for Passover called "borscht." They are also reckoned among the foods of propitious omen to be eaten on New-Year's Day (Ker. 6a; Hor. 12a), based, according to Hai Gaon's apt explanation, upon the play of words ( , "May our sins depart!" = beet) (Responsa of the Geonim, "Ḥemdah Genuzah," No. 166, in "Shibbale ha-Leḳeṭ," p. 266, ). Not so apt is its derivation from the phrase , "May our enemies depart!" pertaining to days of persecution (Ṭur and Shulḥan 'Aruk, Oraḥ Ḥayyim, 583, 1). In Italy, beets are to-day still roasted in ovens or upon hot ashes, constituting the "barba di biesola" (Lenz. 446), concerning which Raphael Meldola gave his opinion in Pisa ("Mayyim Rabbim," ii. 15, 17), as to whether they might be eaten when roasted by non-Jews. Beets are recommended as a remedy (Giṭ. 69a, b; 'Ab. Zarah 28b; Ber. 57b). R. Ḥanina b. Ḥama taught that the Babylonians were free from leprosy because they ate beets and drank a liquor made from lupins, or, according to R. Johanan, because they ate beets and drank this liquor and bathed in the Euphrates (Ket. 77b; Bacher, "Ag. Pal. Amor." i. 3, note). Both Greek and Latin authors ascribe medicinal virtue to the Beet (Schuchardt, l. c. p. 53). Löw, Ar. Pflanzennamen, p. 273.